Since ratification of the First Amendment in the late eighteenth century, there has been a sea change in American life. When the amendment was ratified, individuals were almost completely free of unwanted speech; but today they are besieged by it. Indeed, the First Amendment has, for all practical purposes, been commandeered by the media to justify intrusions of offensive speech into private life. In its application, the First Amendment has become one-sided. Even though America is virtually drowning in speech, the First Amendment only applies to the speaker's delivery of speech. Left out of consideration is the one participant in the communications process who is the most vulnerable and least protected--the helpless recipient of offensive speech. 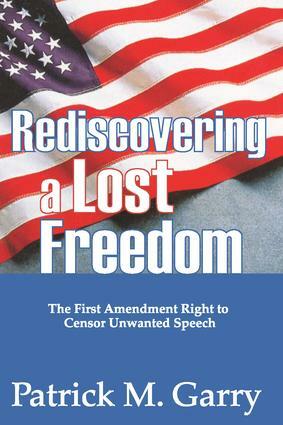 In Rediscovering a Lost Freedom, Patrick Garry addresses what he sees as the most pressing speech problem of the twenty-first century: an often irresponsible media using the First Amendment as a shield behind which to hide its socially corrosive speech. To Garry, the First Amendment should protect the communicative process as a whole. And for this process to be free and open, listeners should have as much right to be free from unwanted speech as speakers do of not being thrown in jail for uttering unpopular ideas.